A new year means a breath of fresh air, new beginnings and a chance to hit the restart button. We typically write out a list of resolutions we want to accomplish (or at least try to) for the year. These things include gym memberships, travel or any rollover goals that weren’t accomplished the year before. I’ve personally decided to take a different approach in 2018, and instead of setting myself up for a potential journey of resolution doom, I plan to simply hit the reset and refresh button. I declutter my life — everything, like emails, to-do lists, work, my apartment and certainly my closet. It’s the perfect opportunity to walk into the new year with a clear mindset, clean space and energy to take on the year ahead. To help you step into the new year, we’ve spelled out eight ways you can declutter your closet and your life for a complete fashion restart in 2018. We don’t necessarily follow the (slightly oversimplistic) “If you haven’t worn it in a year, toss it” rule, but instead focus on the overall process and seeing how these pieces fit into your life, personal style and if they bring you happiness and confidence. 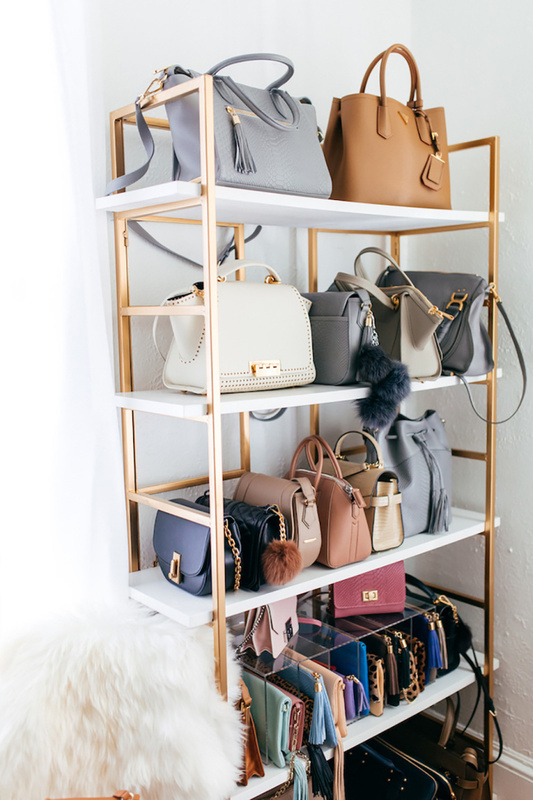 We all know organizing your closet is no easy task. A simple afternoon project can ultimately turn your room into a fashion crime scene. Before you start tearing apart your closet or throwing clothes everywhere, assess the problem and pin down your goals of decluttering. Are you doing this because you have too many clothes you don’t wear? Are you tight on space and have to heave your hangers side to side just to see a shirt? Or do you need to expand your work-wear options? Figure out your ultimate goal before even starting so you can stay on track, because it will help you make speedy, efficient decisions (and prevent consigning regret) later on. 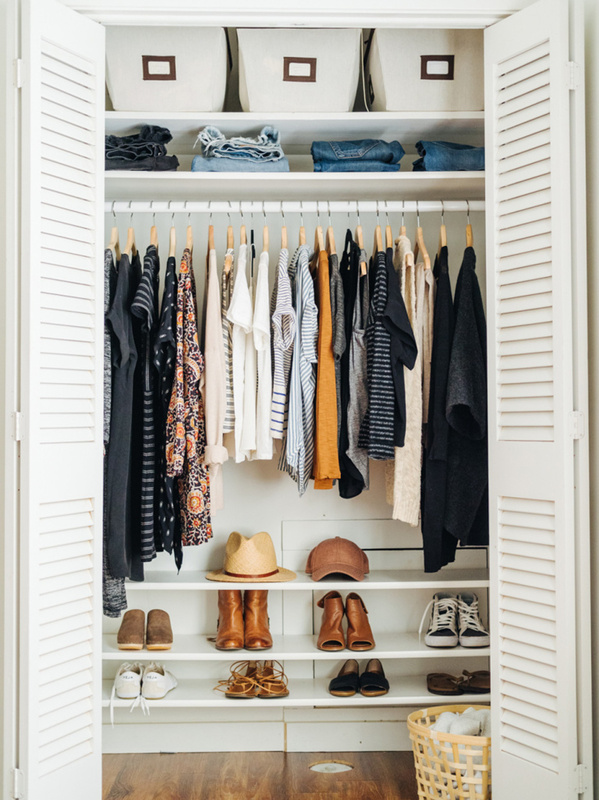 Since pretty much everyone has a short attention span when it comes to closet cleaning, knock out the big, intimidating things first — like clothing and especially items you need to try on. Have bins, trash bags and a good playlist ready, and dive in. Also realize it’s OK to come back to the project after a break later so you’re focusing on it 100 percent and not just shoving clothes back into drawers or onto shelves. Our process is to reverse-engineer the closet. First, take out, analyze and sort, and then once the closet is empty, put back the items you’re keeping. Start the process off positively (and with the easiest part) and grab anything you wear all the time, your staple items, go-tos and must-haves. For me, curated vintage items are a must-have; graphic tees are my go-to; and jeans, a black dress and leather jackets are my staple items. Set these aside in a designated area and assess how many items are in this category. Are you already over your goal limit or do you need to add more to round out your wardrobe? Bag up anything that’s stained, ripped beyond repair, you hate, doesn’t fit you, etc. These should be automatic pieces you’re not super-excited about or pieces that once you put them on, you don’t feel joy or confidence. We highly recommend you donate any wearable pieces to a local women’s shelter or nonprofit or sell them at a local thrift or consignment store. Once your nos are bagged, take them out of the room and start a new bag for any future “no” pieces. 4. Ditch duplicates, similar items, etc. Do you really need three of the same shirt or five dresses that all look super-similar? Probably not. Pick your favorite and get rid of the rest. Does this piece help me reach my goal (i.e., work attire) or reflect my personal style? Does this piece fit my body (and if not, can it be tailored)? Does this item bring me joy or make me feel confident when wearing it? If you answer no to at least two of these questions, it should go into your new no bag. You want to make sure you’re only keeping items that serve your purpose. Whether that’s work outfits, a cute date-night look or you just feel so happy when it’s on you — assess those feelings when going through your closet versus just staring at a mass of fabric on a hanger. Separate the rest of the clothes into the following piles: Yes items, pieces to donate or sell, items that need to be tailored or dry-cleaned and your trash bag of stained, ripped or unwearable pieces. Now’s the fun part! Put your final yes pile back into your closet, but make sure to organize. Categorize your tops, bottoms, outerwear, dresses, accessories, etc. We also recommend color-coordinating within each category so your dressing process is seamless and you can find what you’re looking for faster. If you’re putting things back into drawers, instead of stacking them on top of each other so you can only see what’s on top, fold them to the depth of the drawer and stack them vertically in the drawer, so when you open it, you can see all the folded shirts at once. See tutorial here. 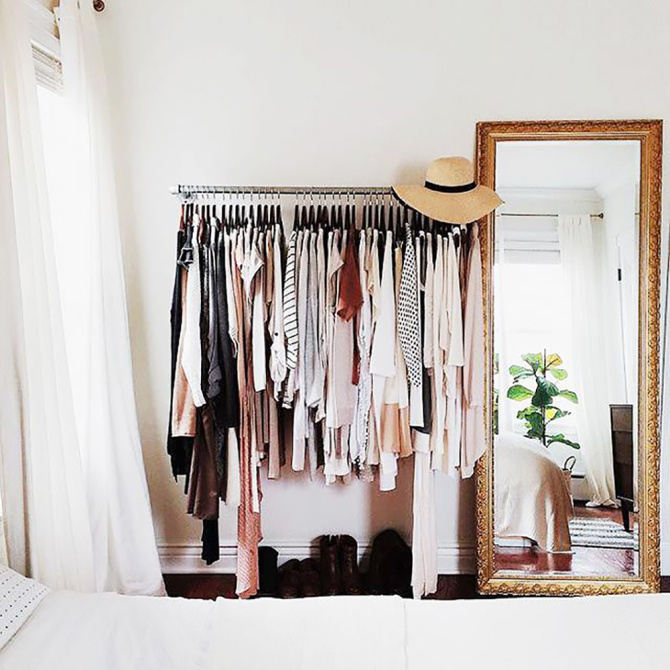 Congrats — you’ve officially decluttered your closet! But you’re not quite done yet. In order to maintain the consistency and flow of your closet, make sure that whenever you add a new piece to your wardrobe you trade it out for an older one. 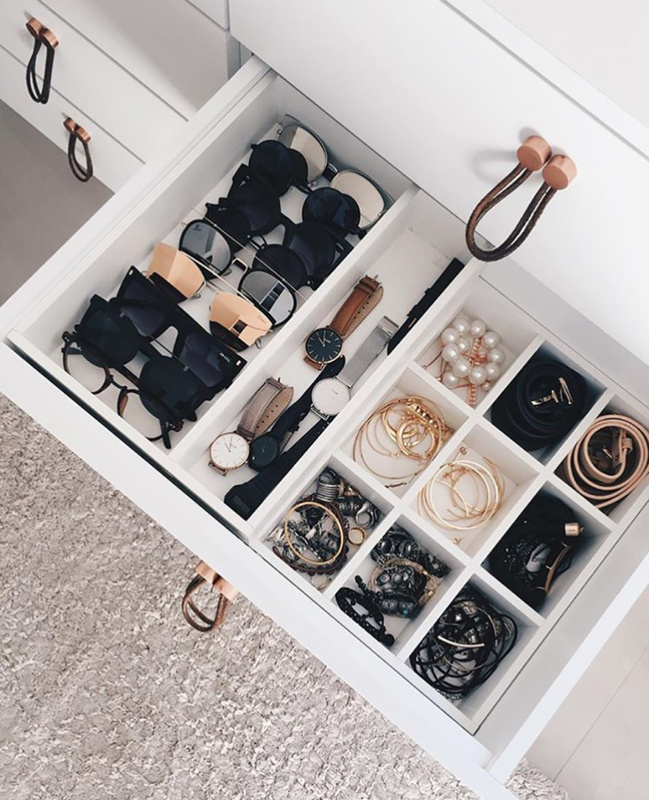 Whether you’re updating a style, realize you never wore that maybe item or whatever it might be, practicing a one for one rule will help you maintain a decluttered and efficient closet so you don’t have to repeat the whole time-consuming process every year.